In view of the current refugee crisis, voestalpine is supporting the international aid organization Médicins Sans Frontières (MSF). In the second part of the interview Franz Luef, Advocacy & Humanitarian Affairs Representative for MSF Austria, talks about his work in Syria, future challenges, and what motivates him. 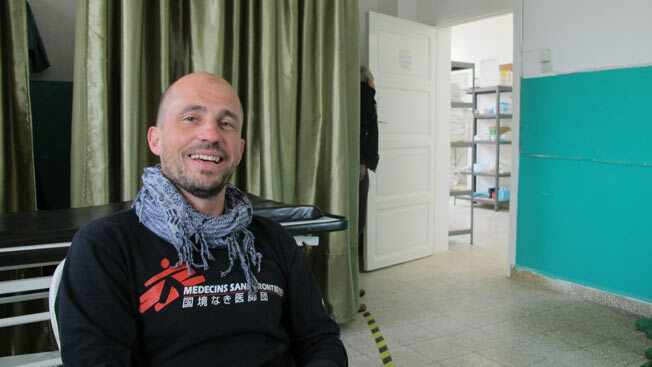 Born in Styria, Franz Luef has been a member of MSF since 2003, working in many different countries and in a variety of positions on their behalf. In the first part of the interview you can read more about his professional career to date and the project he remembers best. The war in Syria is already into its 5th year and over 4 million people have had to flee their homes. You yourself have worked in Syria as well as Yemen and Jordan. What was your role in these places, and what did you experience there? In 2011, right at the beginning of the “Arab Spring”, I was leading a small emergency assistance team in Aden, in southern Yemen. Our task was to support the existing healthcare infrastructure, whether in the form of specialist training, such as how to deal with large numbers of injured patients, or by supplying vital medical equipment. Sadly, the situation in Yemen is worse than ever, and the ongoing conflict has turned the humanitarian situation into a catastrophe. In 2012 I was responsible for setting up a field hospital north of Aleppo. The first job was to find somewhere secure enough to locate a field hospital, a place where the patients, our employees and the local population living near the hospital were all safe. We decided on a village north of Aleppo, near the Turkish border. One of the buildings housed the emergency ward, the in-patient department and a maternity ward, and the second an OP and recovery room. We were able to open the outpatient clinic after just a few weeks, and the field hospital was fully operational just a short time later. Today this aid is more important than ever, with around 100,000 refugees stuck at the Turkish border and a short film about our doctors and medical personnel at the Aleppo field hospital. Then in 2013 I was responsible for assessing needs for a new project in the north of Jordan, on the Syrian border. The project to provide medical care to Syrians with chronic diseases such as diabetes, high blood pressure and heart disease, and who had no access to the Jordanian healthcare system, started early in 2014. One of the greatest challenges here at the moment is to gain access to the Syrian refugees in northeastern Jordan, where 60,000 people are currently cut off from humanitarian and medical care. What challenges do you believe the current refugee problem will continue to pose in the future? Conflict and persecution has resulted in the number of refugees reaching a tragically record level: in 2015 the total number of refugees, internally displaced persons, and asylum seekers all over the world was around 65 million. Only a very small proportion look for protection in Europe; the majority seek sanctuary within their own country, or in neighboring countries. Over the past two years thousands of people have died trying to reach Europe via the Mediterranean. The European deterrence strategy has forced them to take this route. But instead of investing in a functional joint EU asylum system, an effective resettlement system, or rescue capacities on the Mediterranean, and creating safe and legal routes for asylum seekers, Europe continues with its devastating strategy of deterrence and isolation. And in doing so it appears that the EU is not stopping short of ignoring current law and international conventions on the protection of refugees. Our projects show us the consequences of this policy on a daily basis . This policy of effectively keeping those in search of protection at a distance is creating a dangerous precedent. It sends the message to countries outside Europe which have accepted many refugees to date that caring for refugees is a choice, not a humanitarian duty. We are signaling that you can buy yourself free from your obligations. What is the daily motivation behind your work? "There are people who need our help because of war, illness or other grievances. I can and want to offer these people my support. MSF is more than simply a job–I want to play an active role, rather than just having a vision of a better world." And nothing has changed in the past 13 years. Quite the opposite, in fact.